Grand Committee - a Committee of the Whole House, in which no votes are taken, that takes place away from the chamber. Sometimes referred to as 'Moses Room' procedure, it is often used for less contentious bills, saving time on the floor of the House. Public Bill Committee - used, rarely, for government bills of a technical and non-controversial nature. 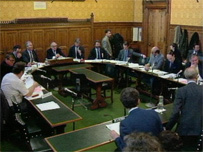 All peers are free to attend but only those peers appointed to serve on the committee may vote. Special Public Bill Committee - very rarely used, resembling a Commons Special Standing Committee with a defined period [28 days] of evidence-taking before detailed consideration of a bill commences. Select Committee - used more often for private members' bills than government bills. This procedure allows detailed investigation of a policy in the bill. The select committee then recommends whether or not the bill should proceed; if so, the committee may make its own amendments to the bill before it is re-committed to a Committee of the Whole House. Unlike the Commons, all amendments tabled may be debated during a committee stage in the Lords as there is no 'guillotine' or programming to restrict the duration of debates.